For two days, leading economists and policymakers from both sides of the Atlantic gathered to discuss recent economic developments, problems and possible solutions. Following an introduction by Leonardo Burlamaqui, Programme Officer at the Ford Foundation, and Dimitri Papadimitriou, President of the Levy Institute, the event began with a speech by US Ambassador Philip D. Murphy on transatlantic relations and US economic policies. After that, the Vice President of the European Central Bank Vítor Constâncio took the floor and argued for complementing a European banking union with European banking supervisory systems. Such a transnational control network would have to be an integral part of the broader economic and political transformation processes and should correspond with efforts to consolidate the European Union on a fiscal, economic and political level. A very eloquent talk was given by Mr. Robert J. Barbera, Chief Economist at Mount Lucas Management LP, whose presentation followed Mr Constâncio’s. Mr. Barbera talked about the role of central banks in Europe and how this has developed over time. He argued that, for most of the period following the Second World War, central banks focused on fighting inflation in their treatment of the economy. Acting under the slogan “I don’t care what the patient dies from as long as it’s not inflation” was traced back to the hyperinflation seen in the crisis of the 1930s, which—Mr. Barbera claimed—is still more present in the collective consciousness of the American public than the Second World War. As a consequence of overly anxious anti-inflation policies, Mr. Barbera suggested that Italy, for example, has to pay much higher interest rates on its debts than the UK, since the Italian central banks are more restrictive in printing money. 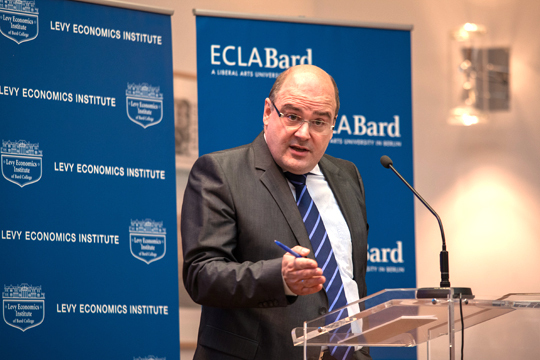 He concluded his analysis with a cautiously optimistic outlook on how the central banks, most notably the ECB under Mario Draghi, are departing from such policies and starting to fight a wider range of economic problems. After lunch, the Parliamentary State Secretary of the German Federal Ministry of Finance Steffen Kampeter gave a talk that left the audience widely impressed. Asked what he thinks about the possibility of a “haircut” for Greece, he smiled and ran a hand over his bald head stating that he does not think too highly of a haircut at the moment. Two more panels of speakers were scheduled for the afternoon. On the first one, Research Economist of the ECB Alexandros Vardoulakis investigated the causes that led to the financial crisis of 2008. His diagnosis pointed to a flaw in leveraging regulations as the central cause for financial instability. General optimism about the development of markets would lead to an increase in the willingness to hold risky assets. If the state would then impose regulations on leveraging, Vardoulakis argued, economic actors, optimistic about the situation, would buy even riskier products to make up for the “losses” suffered through the regulations. When these optimistic expectations are proved wrong, defaults take a turn for the worse. As an alternative to regulating the leverage directly, Mr. Vardoulakis proposed to regulate the ratio between safer and riskier assets per unit of leverage. The risk of overly optimistic expectations was relatively small on the last panel of the day. Greek Member of Parliament and Professor of Political Economy George Stathakis held a presentation on the impact of the euro crisis on Greece. He heavily criticized the EU’s imposed austerity policies as unrealistic and short-sighted. Pointing out that further privatizations are hardly possible since the Greek economy is already privatized to a high degree, he concluded that the programmes meant to save the Greek economy will most likely fail. Even more pessimistic was the next presentation by Jörg Bibow, Professor at Skidmore College and Research Associate at the Levy Institute. In his talk “Misdiagnosis, Ill-Medication and Misguided Reforms: Is the Euro Rescuable?” he proclaimed that the euro was doomed ever since the beginning, because the German export-oriented model is incompatible with other European countries. Any attempt to resolve this dependency would lead to a deflation of debt, which would force more austerity measures, which would further reduce the GDP and hinder debt reduction, thus creating a vicious circle that can throw European economies into recession. The second day was opened by Robert Fisher, President and CEO of the Federal Reserve Bank of Dallas. He talked about “Placing Financial Instability in Context” and related the crisis to political developments in the US. He also talked about the consequences of financial instability for the economically weaker parts of society, drawing from his own experiences. The Vice President of the Federal Reserve Banks of New York and the President of the Federal Reserve Bank of Atlanta also gave talks, and the first panel of this afternoon focused on China and financial instability in Asia. The conference concluded with a talk by L. Randall Wray on the nature of the financial crisis—whether it is a liquidity or a solvency crisis. After a fierce critique of what he referred to as “money manager capitalism” and a look into its democratic implications, Mr. Wray concluded his talk with a few policy suggestions on how to implement financial safety mechanisms. Two days of economic talks left me thinking a lot about interdisciplinary differences. Coming from a philosophy focused background, it was most interesting for me to compare the different styles of talking and thinking, and to wonder about the deep-rooted implicit assumptions of various academic disciplines. Making these assumptions explicit is an essential part of the interdisciplinary education offered at ECLA. I think ECLA has shown that it can offer a meta-critical framework for critical conferences that makes meaningful engagement with a variety of questions from different disciplines possible, while at the same time enabling an underlying openness towards perspectives from the outside. The trial balloon for further adventures – mission accomplished.